With Sedona often being named as one of the most beautiful places in America, the question isn't whether or not you should visit, but rather what you should do when you get there. And Sedona has a lot to offer, including gorgeous red rock views, hiking, local artwork, and more. Here are our picks for the 10 best things to do in the city. No trip to Sedona is complete without a hike. There are easy hikes here, and then there are more challenging ones, but some of the best hiking trails can be found in the Coconino National Forest. Whichever trail you choose, be sure to show up early. And don't forget to stock up on water and sunscreen! The only way to know how awesome the jeep tours in Sedona are is to experience one for yourself. Thankfully, there's Pink Jeep Tours, which has been operating for 50 years—so to say they know how to provide a good time would be an understatement. Don't wait to book your extreme off-road adventure. Many believe that vortexes project energy out of the earth—and the city of Sedona is said to be a vortex. If you're in need of some healing energy, head over to Bell Rock or Cathedral Rock, park your yoga mat, and soak it in. Whether you're religious or not, the Chapel of the Holy Cross is sight you won't want to miss. Why? The outstanding architecture, of course! 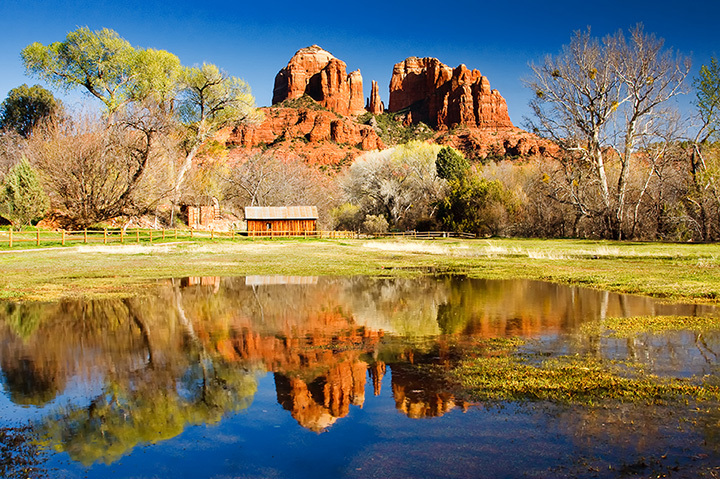 Picture this: a tall, narrow church tucked between the bright, bold red rocks of Sedona. Trust us when we say: you have to see it for yourself. If you can't get enough of the red rocks, you won't want to leave Sedona without a trip to Red Rock State Park. It features 5 miles of trails set against lush greenery—all leading to beautiful vistas of red rock. If you're looking to take a treasure home from your trip to Sedona, you can't forget the internationally renowned Arts & Crafts Village. Originally intended to be a community for artists, the best shopping in the city can now be found here. But the art hasn't been forgotten, either. Many of the village's stores continue to design and produce their wares locally today. When you think about wine, Arizona probably isn't the first thing that comes to mind. But believe it or not, the Verde Valley in the surrounding area of Sedona provides winemakers with the ideal climate to do their thing. If wine is yours, this self-guided tour will take you to four local wineries and six tasting rooms, so you'll get to taste plenty of local wines. The Mii Amo spa takes a holistic approach to rejuvenation, according to its website. Services draw inspiration from Native American traditions and include therapies, a Sedona clay wrap, and meditation, to name a few. Want to find your center? Book your service today. If ancient history is your passion, the Palatki Heritage Site is not to be missed. The three different hiking trails provide opportunities to see cave and cliff dwellings, pictographs, and more. In addition to the site itself, the knowledgeable and enthusiastic staff also receive consistent praise. Located in Old Creek Canyon, what is now Slide Rock State Park was once an apple farm. It's true! Cool off with a slide down the natural slide, admire the natural beauty of your surroundings, and do some exploring, if you're so inclined.